Love these bedskirts. The price was great and I got it in several colors so that I can change them to match the bedspreads that I change monthly. Haven't washed any yet, so I don't know how that will turn out, but, since it is microfiber, I assume that if I get it out of the dryer soon enough it will be minimally wrinkled. Best parts about these - heavy enough to not be see-through and they are tailored nicely to fit well. I cut away all but 18" of the under mattress fabric so that I don't have to lift the whole mattress every time I change bedskirts. It makes life real easy for me as the 18" fabric is enough to hold the bedskirt firmly in place and makes the change an easy one. The material is ok but the description says it is 15 inch drop and it is 14 inch drop. I bought because I really need the extra inch, I'm using anyways but change the description, please! Well made, lots of colors, 15 inch length. The bedshirt is a nice color and fits the bed. The microfiber is easy to clean and the 15 inch length is just right. For a Queen size bed the drop on this skirt could have been an inch longer. Overall satisfied with quality. I wanted a straight, non ruffled bed skirt and this one does nicely. The 15 inch drop is perfect. Fabric is very thin, cheap and in my opinion not good quality. The drop is only 14inches. I liked the fabric and color (ordered black), the fit, and certainly the price. It was not, however, a 15" drop - more like 13 inch (I actually measured since I saw this same issue in an earlier review.) But it fit well and the couple inches of space showing didn't really upset my applecart. I did a minimal press on it as it was wrinkled upon opening. Easy peasy. Overall a good buy for me. Color is great and the 15 inch drop allows it to go completely to the floor. It's not the vacuum's favorite thing, but it surely helps with dust under the bed! That is the purpose after all! I needed a navy 15inch drop bedskirt for the guest room. For the price, I found the material to hang well. The color, length, and size were as pictured and just what I needed. The tag reads Experience the comfort and soft touch as a 1500 Thread Count 100% Egyptian Cotton Blah Blah Blah Tiny print: Made in China Tinier print: 100% Microfiber. Bought the gray. Color true to website. Didn't have the big wrinkle problems others mention but I've put it under an eyelet bedskirt for layering, so it would not be an issue. If wrinkly, suggest you put in dryer with a damp towel for several minutes. It has nifty box pleat details at the sides that are not evident from the photo. It's fine and the price cannot be beat. I am happy with the bedskirt. It lays nicely and is the perfect length -- the 15 inches. I would recommend this purchase. This bedskirt is NOT Microfiber; in fact, the material (whatever it is) is ultra-thin and extremely WRINKLED. It also appears to be much shorter than a 15-inch drop (bottom is about 6 inches from the floor), but that may be partially due to all the wrinkles. There are also pleats in the center panels which are not shown in the photo (at least I think they're pleats...could just be more wrinkles). COMPLETELY disappointed in this item. Nice bedskirt for the price. 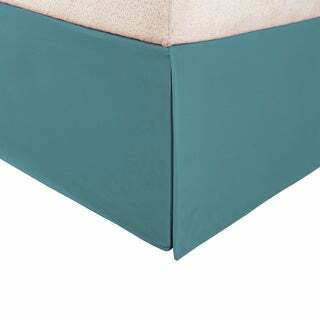 This is a nice quality bed skirt for the price. However, if you absolutely need a 15-in drop bedskirt I would buy a different item. I measured the drop after ironing and putting it on my bed and it was short by close to an inch. Disappointed but it will have to do until I can buy another one at the store that is the advertised length. As others have said, this is 100% Egyptian cotton and not microfiber. Egyptian cotton is my preference, so this is a great value for the price and free shipping to boot! I ordered the queen size in taupe. The color matches our IKEA duvet set perfectly and really puts the finishing touches on our bed. The fabric is good quality...seems shorter than 15 inches though. By my measurement, this was a 14-inch drop, not 15. "Microfiber" led me to believe this would be a little thicker, but it is a very thin polyester, like a cheap sheet. I needed a bedskirt that was a little longer than the norm and this one definitely covers that extra inch on my bed. The quality is good.